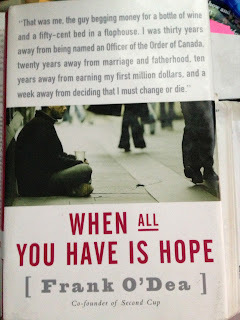 "When All You Have is Hope"
Now here is a book I would like to recommend. It is the story of Frank O’Dea, the co-founder of Second Cup. I only heard of Frank O’Dea this past winter. He was the keynote speaker at the fundraising gala for the Joy Smith Foundation in April 2013. 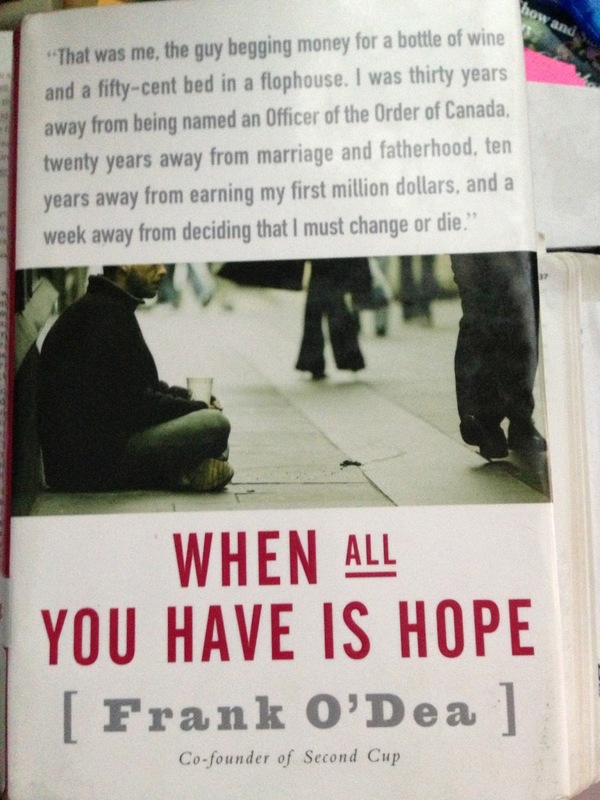 When I decided to attend the fundraising gala I thought I better read the book he wrote before I hear him speak. The first half of the book is not an easy read. Sexual abuse by a priest and a police officer drove him to alcohol. He wasn’t able to keep a job, and his family couldn’t handle his drunken presence any more. After losing everything, he landed on the streets of Toronto. While living on the streets he had met a store owner that was kind to him. This store owner would give him 5 dollars whenever Frank O’Dea would come in and clean up in the store. The radio was playing all day long. And while Frank O’Dea was working he would hear one phone number mentioned repeatedly, a hotline number if someone needed help. One day Frank O’Dea had had enough of his life on the streets and he was determined to change. He wanted to call this number, but he had no money for the phone call. So he begged for a dime. All he needed and wanted was a dime. When he got the dime, he made the phone call. In his speech, Frank O’Dea pointed out that we don’t always know what will happen to the money we give to a person in need. We don’t know if this person that is approaching us will use the money for alcohol, drugs or if he/she will use it to make that life-changing call and turn their life around. This definitely taught me a lesson not to judge but to give. And to give without attitude. Just give. Leave it up the person to decide what they will do with the money. When I hand over the money it is their responsibility, not mine. What is the next right thing in front of me and you that we need to do? How Do You Remove a Thistle Root?